Low Profile High performance coax adapter card for PCI bus with plug-and-play. Emulates IBM interface cards for use with other emulation software. 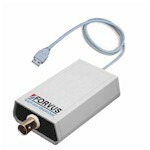 Provides 3482 features and superior performance when used with Forvus emulation software products. Not for use in standard size PC chassis. Includes Forvus Emulator - PCI. High performance coax adapter card for PCI bus with plug-and-play. Emulates IBM interface cards for use with other emulation software. Provides 3482 features and superior performance when used with Forvus emulation software products. Includes Forvus Emulator - PCI. High performance coax adapter for USB. Provides coax to TN3270 via included DFTN Gateway for use with included Forvus TN3270 emulator or third party TN3270 emulators. Single user Windows 95/98/NT/2000/XP based IBM 3270 emulation software supporting CUT Coax, DFT Coax, SDLC, IEEE 802.2, Novell's Netware for SAA, Microsoft SNA Server, and TN3270/TN3287 over TCP/IP connections. One package offers most major connections.